Fairfax Contractor is a remodeling contractor and a general contractor. Fairfax Contractor specializes in home remodeling projects and Commercial contracting, in Northern Virginia. Our company is located in Manassas Virginia, and we are a local remodeling company that can handle just about any type of project concerning your home or business. Fairfax Contractor holds a Class A contractor’s license 2705154312 exp. 7-31-2020. Our company is licensed with the Commonwealth of Virginia, DPOR, has the endorsement stamps of CBC (Commercial Building Contractor), and RBC (Residential Building Contractor). Fairfax contractor is also an insured contractor with both general liability and workers compensation insurance. 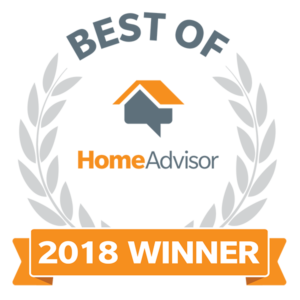 We own an active We have been voted as one of the best construction companies in Northern Virginia. Fairfax contractor is also an insured contractor with both general liability and workers compensation insurance. As the owner I have over 40 years experience as a master builder in Northern Virginia. Fairfax Contractor owns an active wrought iron fabrication shop that can custom build all types of wrought iron railing. Our main office is located in Old town Manassas 8805 Earl St Manassas, and or welding shop is located at 7105 Gary Road Manassas Virginia. 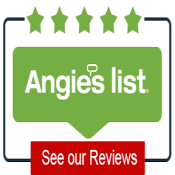 We have great customer reviews, A+ rated on the Better Business Bureau, and hold an A rating on Angie’s List. Call us today at 703-725-7945 for a free estimate on any upcoming project. Services Fairfax Contractor can perform in Northern Virginia include a wide scope of contracting projects. As a general contractor we are experts in many areas of commercial and residential construction. 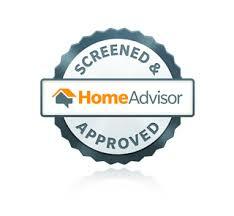 We work with local real estate professional looking to get a house ready for sale. This may include basement waterproofing, foundation problems, painting, drywall repair, and so much more. Our design build projects include additions, basement remodeling, kitchen remodling, screen rooms, and decks. As a General Contracting company, we install all types of roofing, siding, and replacement gutters. We offer very specialized installation of ADA wheelchair ramps. Fairfax Contractor can do the job and do it with high-quality standards that provide complete customer satisfaction. Finding a good remodeling contractor in Northern Virginia may be a bit of a task, but when you call Fairfax Contractor we can help you with all your home improvement and general contraction needs. Listed below is a snap shot of other types of work we do. Fairfax Contractor custom builds and designs all types of patios in Northern Virginia. Our patios can be designed to fit any budget, and we are capable of creating one-of-a-kind patio for your home. 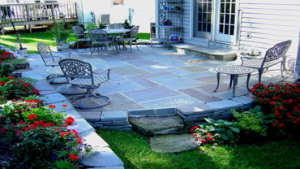 One of our most popular patio styles is a Pennsylvania square cut or irregular flagstone patio built a on concrete base. We are also experts in installing travertine patios, interlocking paver patios, brick patios, and a wide variety of natural stone patios. As a licensed contractor with the state of Virginia we can pull the necessary permits in Arlington County, Fairfax County, Loudoun County, and Prince William County to build stairs from your home to your new patio. Typically, a patio on grade does not require a permit. Our patio projects can include various upgrades such as low-voltage lighting, outdoor fireplaces, seating walls, outdoor kitchens, and fire pits. Patios have been built in Northern Virginia since colonial times, and we utilize many different types of clay pavers that would make a beautiful addition to your home. If you are instead in having a custom-built patio call us today for a free consultation and design. Fairfax Contractor is a professional masonry company that can repair existing problems you may have with the brick or stone hardscapes. We repair all types of problems such as failing patios, walkways, retaining wall, and any masonry problem your Northern Virginia home may have. 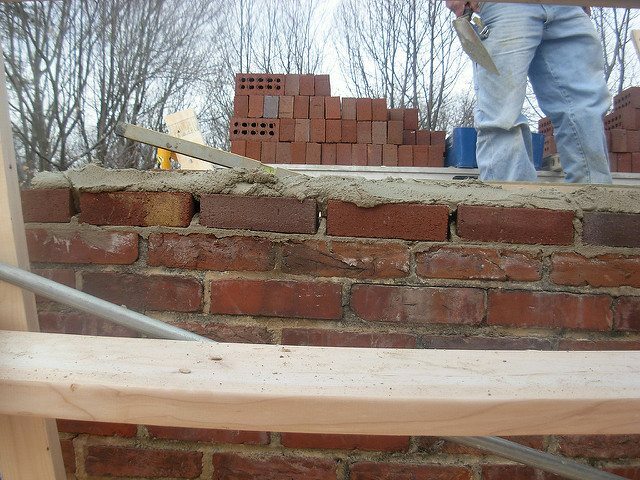 We are capable of repairing broken brick and stone on retaining walls, re-point brick and stone on walkways, and patios. It is often difficult to find a masonry contractor that is willing to take on smaller projects. Here at Fairfax Contractor we are definitely your go to contractor for all types of small repairs that may be needed at your home. Click the link and we can provide all of the necessary information on how we fix brick, interlocking concrete pavers, flagstone, and slate. 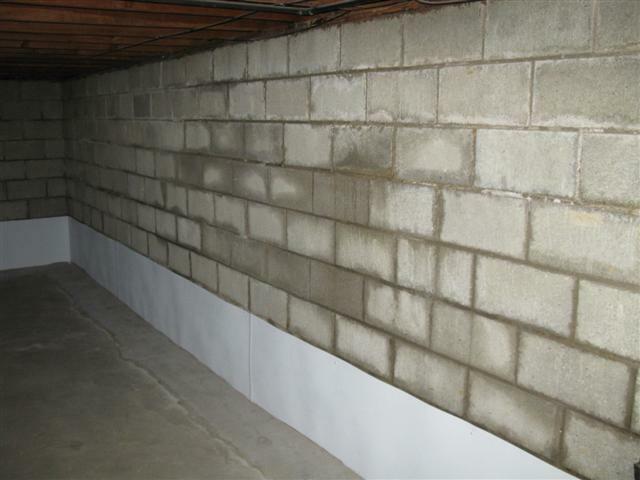 Basement waterproofing is key to having a mold free, healthy, living space. Fairfax Contractor has the ability to create a affordable solution for your flooding basement. 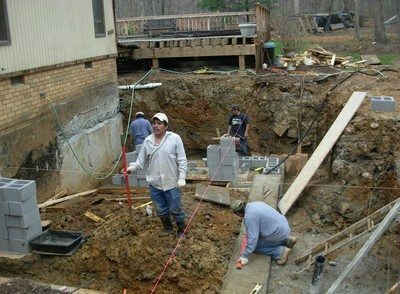 We offer many time-tested solutions ranging from interior French drain systems, sump pumps, fixing cracked foundations, and exterior foundation repair. If you are thinking about remodeling your basement, or just sick and tired of your basement flooding each and every time we have a heavy rainstorm in Northern Virginia we have the methodology fix your basement waterproofing problems once and for all. Foundation failure can progress to major structural problems within your home. Often times simple repair, like epoxy injection in cracked basement walls, or Carbon Fiber strips for Block Foundations, can be installed without the need for a Structural Engineer. We use the latest technology to install carbon fiber strips basement in failing block walls. Our services also include epoxy injection for cracked poured concrete basement foundation walls. When needed we also work with Structural Engineers to develop more complex foundation plans to underpin, reinforce basement walls, and deal with a wide range of residential foundation issues. 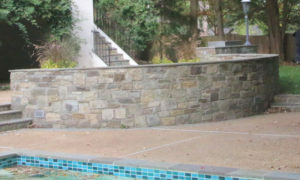 Retaining wall contractor Fairfax Contractor is a Northern Virginia company that can build all types of retaining wall projects. In most of the Northern Virginia Counties any retaining wall over 36 inches will require a building permit. Smaller walls such as plantar walls, garden bedding walls, and small retaining walls are exempt from the building permit process. If the retaining wall project you are looking to construct is over 36 inches Fairfax Contractor can utilize two methods to secure the building permit. The first way is to utilize the Fairfax County detail for retaining walls, this method utilizes plans that the county has designed for 4 foot, and 5 foot tall retaining walls. Only residential retaining walls fall under the category of typical retaining wall detail plans in Fairfax. On the Fairfax County retaining wall detail plans located on the county website shows both a wood retaining wall detail and a engineered masonry detail. Need to solve a drainage problem? If you have a flooding basement or a wet yard, we have the specialist to solve all types of drainage problems. We install French Drains, ACO Floor Drains, Sump Pumps, and Battery Backup Sump Pump systems. With the unpredictable strong weather systems that pass though Northern Virginia, it is important for your basement to be able to handle large amounts of rain and melting snow that can easily create flooding conditions. Sometimes our drainage solutions for your home can be as simple as adding down spout extensions, or simply regrading the area around your home. If your basement is flooding or has flooded, we can both help in the elimination of standing water, and stop this calamity from recurring. 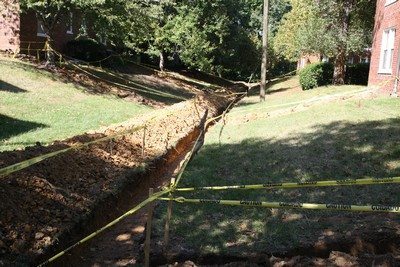 Let Fairfax Contractor tackle your home's drainage problems with professional advice and installation second to no other drainage contractor in northern Virginia. If you have a emergency flood in your basement, call us at 703 725-7945 for immediate service that could save you thousands of dollars. Fairfax Contractor builds all types of wrought iron rails. 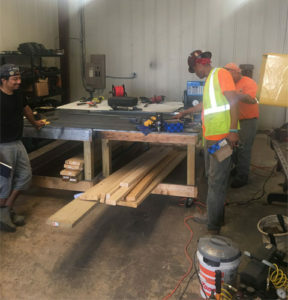 We can custom fabricate a wide variety of different guardrail systems, that can be used for both interior and exterior applications. Wrought iron welding is done in our shop to create custom, code compliant systems for your Northern Virginia home. In addition to creating custom fabricated wrought-iron railings, we can also build both residential and commercial fences, gates, and architecturally designed wrought-iron projects.We also do mobile wrought iron rail repairs on site. Safety is always a concern, if your existing wrought-iron railing as become rusted we offer on-site, repair of existing railing.For more information click the link above. Fairfax Contractor can install an new flagstone, brick, travertine, or concrete walkway. We are expert contractors in removing and installing all types of walkways and sidewalks. If you are looking to replace or upgrade your current front walkway we have many options to chose from ranging from finished concrete, brick pavers, flagstone, travertine, or concrete pavers. We have replaced front walkways, stoops, and sidewalks in all Northern Virginia Counties. If you are looking for a contractor in Fairfax or Northern Virginia we beleive you will find our company to be a perfect fit to satisfy your needs. We hand select our flagstone from square cut to irregular to fit the style and feel of your home. 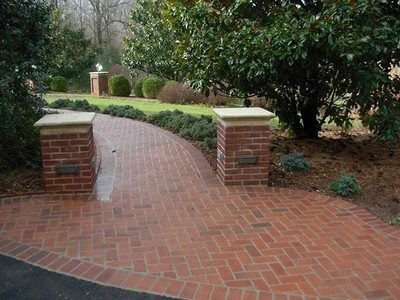 We install traditional brick pavers that have been used as walkways in Virginia since colonial times. In addition we install Travertine pavers that are all the rage today. Fairfax Contractor has the personnel to design and construct the perfect front walkway, stoop, or sidewalk project for your Northern Virginia home. We have been installing replacement windows in Northern Virginia for decades. We carry a wide range of thermal vinyl replacement windows. With the high costs of energy today what could be smarter than replacing your worn, leaking, builders windows with new energy efficient replacement windows. We can replace double hung , slider and picture windows with Energy Star rated replacement windows with Low E, and Argon filled sashes. Many of our customers have shopped around for the best value in thermal vinyl replacement windows and time and time again we hear that we have the best brands, expert installation, and the best warranties in the window business. This is why Fairfax Contractor has come to be known as the go to contractor for replacement windows. Fairfax contractor has a full line of replacement windows that include fiberglass, PVC vinyl, and would clad windows. 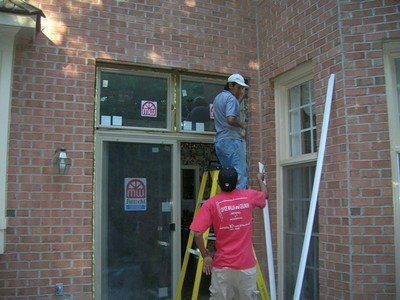 Unlike many window contractors in Northern Virginia we can cut through a brick wall and install a new window where a window does not exist presently. Fairfax contractor being a design build company can successfully help you design, and remodel your bathroom. We staff some of the areas finest tile setters, and have contacts for all types of ceramic tile, and bathroom fixtures. 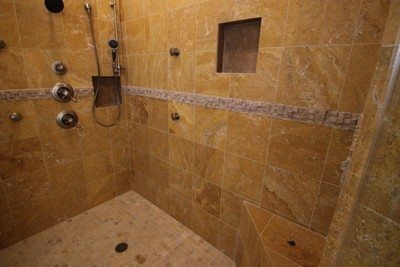 Visit our page concerning bathrooms and see just what Fairfax Contractor can do to help you remodel a old and outdated bathroom into the bathroom of your dreams.If you're looking for a simple upgrade to a worn-out old bathroom, or installing a magazine quality, complete bathroom modeling project we're here to help. Some of the bathroom remodeling projects we perform include installing new a new bathroom in your basement, remodeling powder rooms, and master bathroom renovation. Our design staff is experts in picking out the right bathroom fixtures, tile, paint, and other accessories to make your bathroom upgraded beyond what you can imagine. Our design consultations are free, and we can give you a complete consultation on how to improve in the bathroom in your Northern Virginia home. Fairfax Contractor serves the Northern Virginia area replacing worn out entry doors. We carry all of the name brands including ProVia, Anderson, Pella, and Marvin doors. We are a turnkey door contractor, meaning we will not only estimate the cost of your door, measure your door ordering, and install your entry door project. Unlike many of the box stores, our door projects include many features that competitors do not include. Features we include in order door projects include cleanup and removal of your old door, custom exterior molding, and interior molding installation. Our pricing is some of the most competitive in the market, and are door warranties are unmatched. 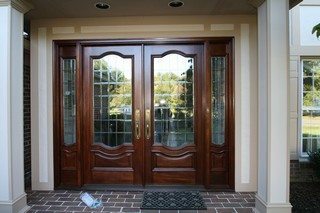 If you're looking to replace any exterior door including sliding glass doors, front entry doors, or French doors don't hesitate to call us for a free estimate. 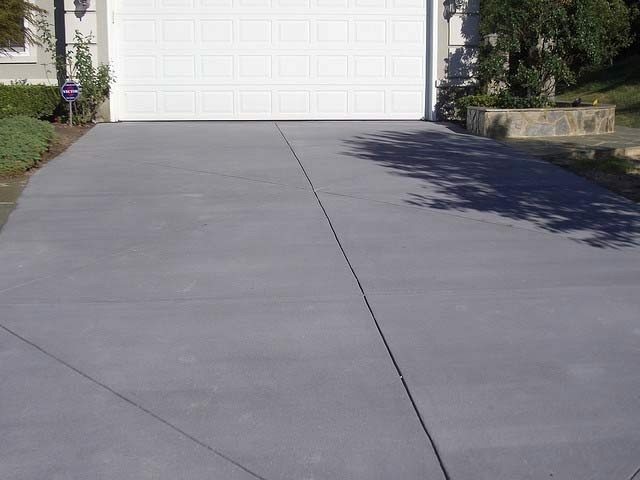 Replacing your cracked, worn existing drive way will add value to your home, and added resale value to your home. We are state-of-the-art contractors that have the ability quickly install a brand-new driveway within a day or two. We utilize a technique of preparing the base of your driveway, pour a custom blend of concrete that includes residential fiber, a 4000 psi mixture, with plasticizers that will create the fine broom finish that will give your driveway a incredible look. There are many options in a new concrete driveway, including colored concrete, exposed aggregate, or a brick lined concrete driveway. Fairfax Contractor is a general contractor performing remodeling services in Northern Virginia Counties including Fairfax County, Arlington County, Loudoun County, and Prince William County VA. We also do remodeling projects in the following Fairfax County cities including Alexandria, Annandale, Burke, Clifton, Centreville, Chantilly, Fairfax, Fairfax City, Fairfax Station, Falls Church, Great Falls, Herndon, Kingstown, Langley, Lake Barcroft, Lorton, McLean, Newington, Springfield, North Springfield, Oakton, Oak Hill, Reston, Springfield, Sterling, Tyson's Corner, and the Vienna, Virginia. Fairfax Contractor also is licensed to do work in Arlington County, including the cities of Arlington Forest, Ballston Crossings, Cherrydale, Claremont, Rivercrest, Westover, and Yorktown, Virginia. In Loudoun County, we install all types of home improvement projects in the cities of Ashburn, Aldie, Bristow, Dulles, Countryside, Lansdowne, Leesburg, Purcellville, Potomac Falls, South Riding, and Stone Ridge Virginia. And finally, we work in the cities of, Prince William County, including Dumfries, Dale City, Gainesville, Haymarket, Lake Manassas, Lake Ridge, Manassas, Manassas Park, Occoquan, Triangle, York Shire, and Woodbridge Virginia.